A light Sponge coated in rich chocolate and rolled in coconut, topped with a Mango mousse. A Perfect snack size treat. Preheat the oven to 170c. Line a half gastronome tray with baking paper. Halve the vanilla pod and scrape the seeds from the pod. Melt the MEADOWLAND Professional 250g, allow to cool. In a kitchen mixer, whisk the eggs, vanilla seeds and sugar together until pale and creamy. Sift the baking powder and flour into the mixture and gently fold until fully combined. Gradually fold in the melted MEADOWLAND Professional 250g. Pour into the lined tray and bake for around 20-25 minutes until a skewer inserted into the middle of the cake comes out clean. Divide the cake into 36 small square pieces. Sift the icing sugar and cocoa in separate bowls. In a pan melt the MEADOWLAND 250g and mix in the milk. Gradually whisk in the cocoa powder until it is fully dissolved. Gradually whisk in the icing sugar until combined. Remove from the heat and keep warm. Place the desiccated coconut into a large bowl. 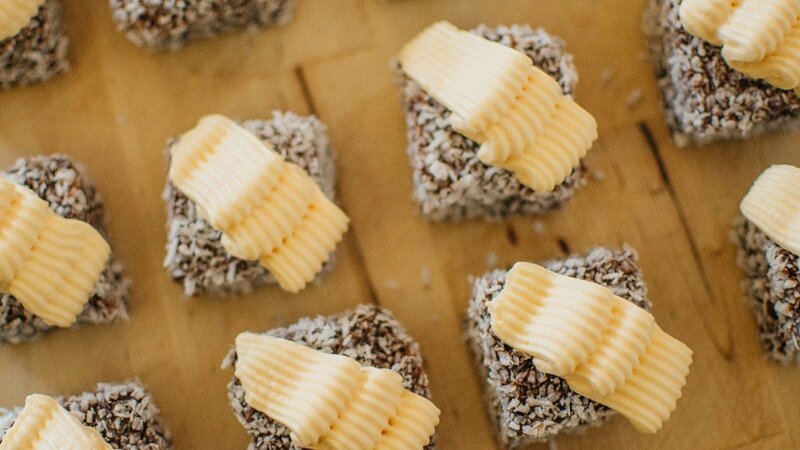 Dip the lamington sponges in the chocolate glaze and then roll in the desiccated coconut. Place onto a wire rack to set. Repeat the process until all the sponges are coated. Pour the cold milk into a bowl and add the CARTE D’OR Mango Mousse. Whisk with an electric mixer for 2 minutes at a low speed followed by 5 minutes at high speed. Place the lamingtons on serving dishes. Pipe the mango mousse on top of the lamingtons and finish by zesting a lime over the piped mousse.